Joining Bateman and McAdams in the cast are Billy Magnussen (“Bridge of Spies,” TV’s “American Crime Story”), Sharon Horgan (Amazon’s “Catastrophe”), Lamorne Morris (TV’s “New Girl”), Kylie Bunbury (TV’s “Pitch,” “Under the Dome”), Jesse Plemons (“Black Mass,” TV’s “Fargo”), Danny Huston (“Wonder Woman,” “X-Men Origins: Wolverine”), Chelsea Pereti (TV’s “Brookyn Nine-Nine”), with Michael C. Hall (TV’s “Dexter” and “Six Feet Under”) and Kyle Chandler (“Manchester by the Sea,” TV’s “Bloodline”). 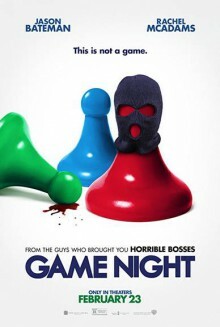 GAME NIGHT is an R-rated comedy that stars Rachel McAdams and Jason Bateman and will open in theaters February 23rd. Join LatinoScoop at an exclusive advance screening of GAME NIGHT in select locations below. Click on the link below for your city and enter the code. If you download a screening pass and aren’t able to use it, please share it with someone who can attend. There are limited number of passes available for each location. Screening passes are available on a first-come, first-serve basis. Additional passes will not be added once they are all redeemed. Anyone downloading a screening pass is advised to arrive early to secure seating. The theater is intentionally overbooked by the studio to ensure a full house. Plan accordingly to arrive with enough time. All advance screenings below will take place on Wednesday, February 21.